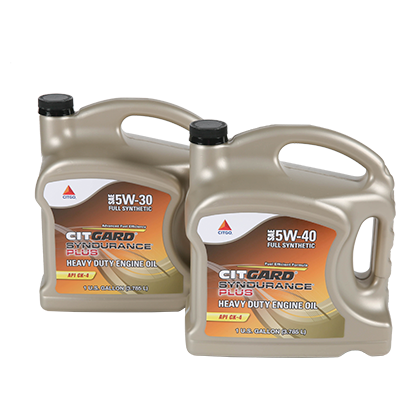 CITGO CITGARD SynDurance PLUS Synthetic Heavy Duty Engine Oils Advanced Fuel Efficiency formula delivers maximum fuel economy, extreme cold temperature performance and superior engine durability. These engine oils contain a careful balance of synthetic base oil components with a shear stable viscosity modifier, which insures heavily loaded engine parts have protective oil films. CITGO CITGARD SynDurance PLUS Synthetic Heavy Duty Engine Oils meet the performance requirements of newer engines operating at higher temperatures, with lower RPM, higher torque and advanced combustion design. CITGO CITGARD SynDurance PLUS Synthetic Heavy Duty Engine Oils have been field tested for over a million miles with engine teardown inspections compared to premium SAE 15W-40 viscosity grade oils. The results indicate superior wear protection and oil consumption control.